When they expel water from their tissues to renew it, they look like leather, hence their name leather corals. They are easy to keep in well-aerated water and they grow quickly. 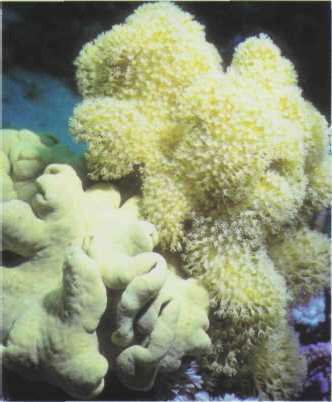 Their color varies according to the concentration of Zooxanthellae present. Their weekly diet consists of a fine choppy of mussels and other seafood. They must be positioned with care in the aquarium, well away from other stinging species. Two leather corals are most commonly found in the aquarium trade: Sarcophyton glaucum and 5. trocheliophorum. Size: 20-30 cm. АЙРАПЕТЯН Борис Александрович (р . 1955), российский сценарист и режиссер. Поставил по собственным сценариям фильмы: "Там, где небо лежит на земле" (1988), "Убийца" (1993) и др. Основатель и президент конкурса национальных премий "Св. Анна" среди киношкол России, СНГ и стран Балтии.